Congratulations to Clayton Kershaw on winning his 3rd Cy Young Award!! WOO-HOO!! Way to go kid!! I remember when Clayton Kershaw won his first Cy Young award. The Dodgers issue a last minute invite to Dodger Season Ticket Holders for the Clayton Kershaw Cy Young News Conference and I got to go! 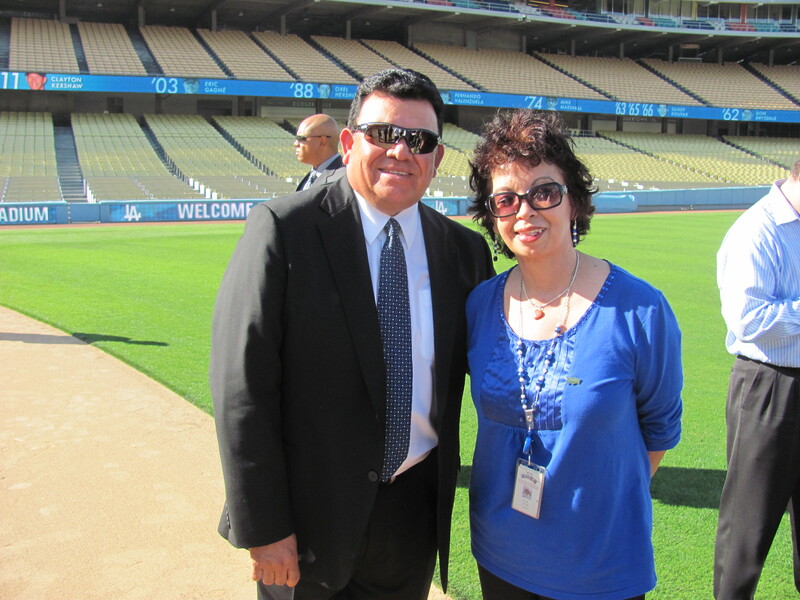 Dodger Season Ticket Holder Emma Amaya was constantly checking her phone on Nov. 17 while in a company webinar. She knew this was the day that the National League Cy Young Award winner would be announced. So every pocket of time she could find during the webinar at her company office in Chatsworth, she’d keep checking the news and her email. The news came around 11 a.m. that Clayton Kershaw won the Cy Young Award. Then, moments later, an email came through from the Dodgers inviting her, as a Season Ticket Holder, to come down for the news conference behind the mound at Dodger Stadium. Without a car and still at work, she asked her Human Resources department if she could leave and take the company car because she had “an emergency.” Luckily for Emma, they allowed her to do both and she made her way to Dodger Stadium for a first-of-its-kind invitation extended only to Season Ticket Holders. 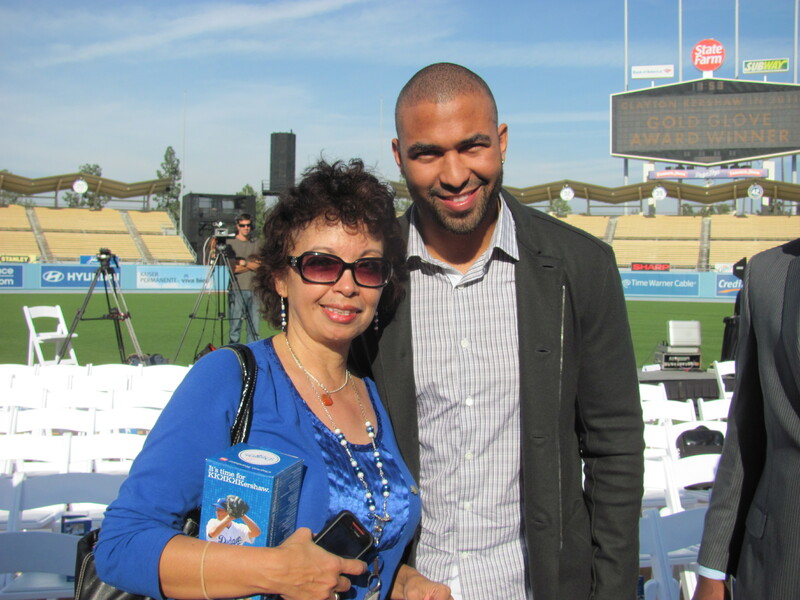 Mixed in with the media, Dodgers Matt Kemp and James Loney, legends like Vin Scully, Fernando Valenzuela and Don Newcombe, and other Season Ticket Holders, Emma sat with the group for a rare experience. Kershaw stood in front of a podium as media asked questions. Then Emma stood up and asked her own question of the 23-year-old lefty. After the Q&A broke up, she took pictures with Kemp, Loney and Valenzuela and chatted all of them up. The 2012 season will mark Emma’s eighth consecutive year as a Season Ticket Holder. She proudly cheers from her seat in Section 3 on the Top Deck. 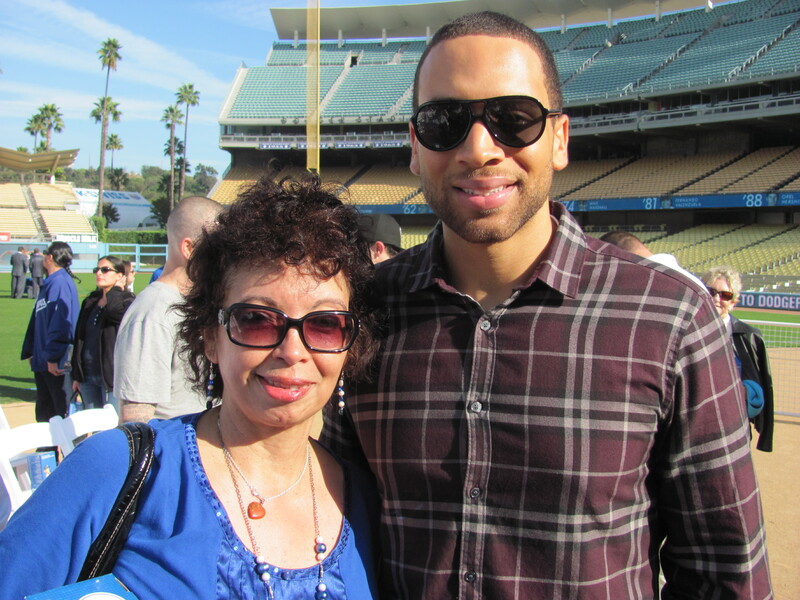 But it’s not just during the season that she can be on hand for special Dodger moments. No invitation this time but that is OK! Enjoy your third award kid! Pepe Yñiguez is part of the Dodgers Spanish broadcasters. He is entering his 14th year with the Dodgers. He has also hosted “Central Deportiva”, a werkly sports talk show on KWKW. He has also broadcasted many events for Fox Sports International including the 1997-2005 World Series. He has also broadcasted the 1997 MLB All Star Game and the Caribeean Series. In addition, from 1993-1995 he also served as the Spanish radio broadcaster for the Los Angeles Raiders. 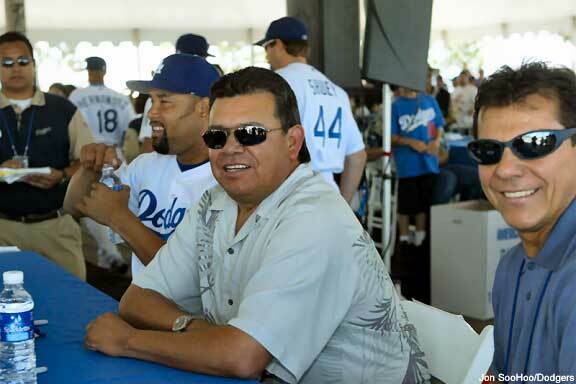 Recently Pepe Yñiguez was telecasting Dodger games in Spanish along with Manny Mota on cable. Because of the increase in Spanish telecasts this year, Jaime Jarrin’s son, Jorge will be covering those games with Manny Mota. Yñiguez will continue to broadcast games on the radio KTNQ with Hall of Famer Jaime Jarrin and commentator Fernando Valenzuela. Pepe is very knowledgeable in the game of baseball. In Pepe’s voice you can hear the passion that he has for the game. His golden voice captures the audience. 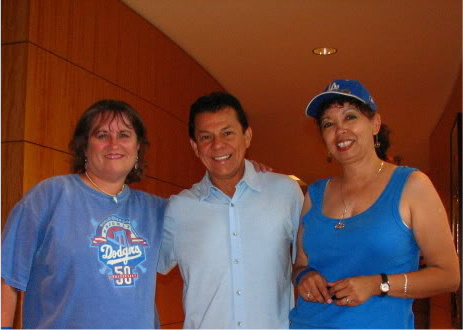 Recently during Spring Training, my friend Lorena and I spent some time talking baseball with Pepe. As is often the case when I get together with Terry Cannon of the Baseball Reliquary & Steve Seemayer, we lost track of time talking our favorite subjects: Baseball & The Dodgers. Que tengas un bonito dia Pepe. Que tengas una gran temporada. Que pronto se te conceda transmitir un no-hitter y que tambien Los Dodgers ganen pronto una Serie Mundial para que te des el gusto de transmitir esos partidasos. Compartes tu cumpleanos con Cy Young. 1st Photo: Jose Lima, Fernando & Pepe, photo by Jon SooHoo. 2nd photo: 2005 Road trip to St Louis, ph0to taken by Sandi. 3rd phto: June 28, 2011 at Minnesota. Road trip. Photo taken by Lorena. I have not created a new post since November 2nd when I posted about our three Dodgers -Matt Kemp, Andre Ethier and Clayton Kershaw winning Gold gloves. 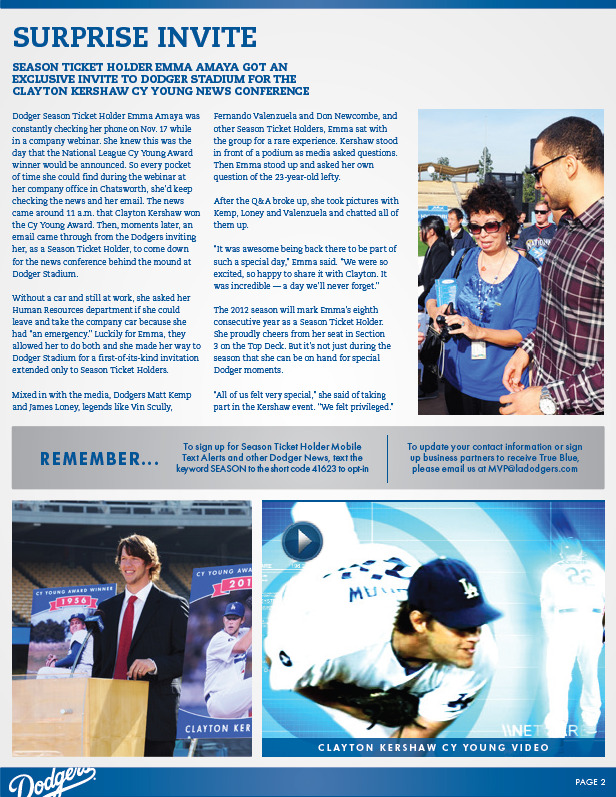 What a happy day in Los Angeles yesterday when it was announced that Clayton Kershaw had won the NL Cy Young Award! I was anxiously waiting for the results on Thursday. I was busy with a Webinar at work with phone and computer busy but I was keeping an eye on my droid. Sure enough it started beeping with the good news. But in addition to the good news there was an email from the Dodgers inviting us season ticket holders to attend the conference on the field of Dodger Stadium. What was I to do when I had taken the train to work and I was still in the middle of the webinar? Good thing it ended promptly at noon and there were no further questions. the email said the conference was to start promptly at 1:30 p.m and that fans could start arriving at 12:30 p.m. I called to see if the company car was available. I was lucky! It was available! I then headed to see my boss and told him I had an emergency and had to leave but would be back later on. What a great day being back at Dodger Stadium! Clayton Kershaw was there with his wife Ellen. Matt Kemp and James Loney were also there. Maury Wills was also there. 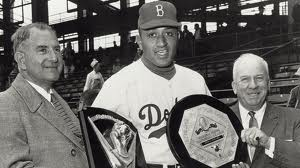 Prior CY Young award winners Don Newcombe & Fernando Valenzuela were also there. Dodgers who have won the Cy Young: Don Newcombe (1986) Don Drysdale (1962), Sandy Koufax (1963, ’65. 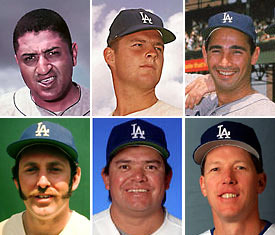 ’66), Mike Marshall (1974), Fernando Valenzuel (1981), Orel Hershiser (1988), Eric Gagne (2003) and Clayton Kershaw (2011).